This month's Daring Bakers Challenge was hosted by Elle from Feeding My Enthusiasms and Deborah from Taste and Tell. The recipe can be found both places, so don't look for it here! The basic premise is that you make a cheesecake, make balls out of it, and dip them in chocolate and other things. I had some creative inspiration that I didn't follow through on, mainly because the texture of the cheesecake was a bit too delicate. 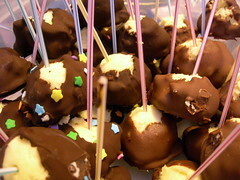 I wanted to make balls and decorate them in three different ways, and turn them into cheesecake pop shish-ka-bobs. It just wasn't meant to be. The cheesecake had a really hard time setting up. I had baked it for double the time required when I took it out because it had started to crack, but I don't think the recipe was as infallible as I would have liked. As a result I had to take an extra day or so with this recipe, allowing more time to work around the softness of the cheesecake. The cheesecake itself was left in the fridge overnight before balls were made, and the pops were frozen overnight rather than just for a few hours before being dipped in chocolate. 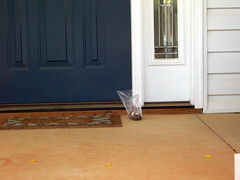 Even as I dipped them, as they came to room temperature the chocolate seemed to want to stick less. When I finished this recipe, I was not feeling like my cheesecake pops were particularly photogenic. I am always bringing recipes into work, but my co-workers never end up in my pictures. Not this time. 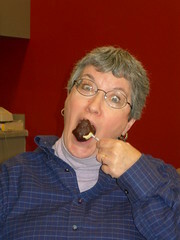 I sent out an e-mail informing them that showing up for break and cheesecake pops meant they might end up in the blog. Caroline, pictured here, was so excited about this idea that she posed for a picture even though she didn't eat a cheesecake pop! 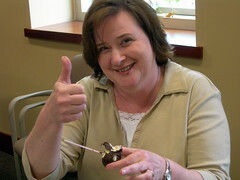 Janet gives the cheesecake pops a thumbs up. Susan models the first problem with how I made the recipe. When I went to the grocery store, they had no popsicle sticks. The only thing I could find were coffee stirring straws, which are remarkably flimsy. 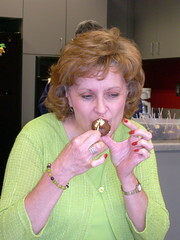 Linda models one way to eat the cheesecake pop, by supporting its weight with the thumb from the other hand. Elaina just decides to attack hers. 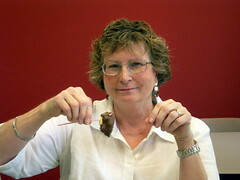 I would like to be able to say that no cheesecake pops were harmed in the making of this blog, but that would be a lie. Ed uses an extra toothpick to try to solve the eating problem, but it falls on the table anyway. 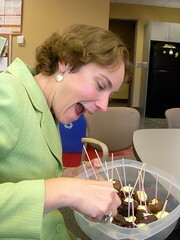 My cheesecake pops were pretty mobile. They even made a house call to be consumed by a librarian who recently had surgery. Not all of the cheesecake got made into pops. This recipe really makes quite a bit! 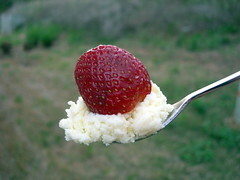 The first strawberries of the season had started to show up, so some of it was eaten with those. It made me wish I had thought to poke some strawberry pieces into the cheesecake balls before dipping in chocolate - that would have been a dream. Speaking of strawberries, I might have bought a gallon today, and might be spreading the strawberry love shortly in my blog. Stay tuned. My house is overflowing with cookbooks. When we moved here in 2006, I did a huge weeding of my collection, just enough to make sure it fit in my designated cookbook cupboard. I'm back to overflowing again, but the way I justify it to myself is that I NEED them. All of them. I have some of my husband's grandmother's cookbooks with her handwritten changes to some of the recipe, and no way am I parting with those. I have an entire shelf of vegetarian cookbooks, another of baking/pastry, and another of my cookbook souvenirs that represent places I've been. The only solution will be to buy another bookshelf. Sometimes, though, some of the cookbooks get avoided. It isn't intentional, they just go in and out of usage. I was given The New Enchanted Broccoli Forest almost eight years ago, for a wedding shower gift. I have dabbled in it from time to time, but felt like I needed to make a serious dent in the recipes. The Swiss Rarebit, a take on Welsh Rarebit, with swiss and wine instead of cheddar and beer, was very tasty over rye bread. Nathaniel deemed it "fondue on a plate." It doesn't look like much, but simple to make and the flavor is astounding. Great comfort food! Lasagna al Pesto was a huge success, even if I went with no boil noodles and ended up with some crunchiness on top. I wish I could have find the green lasagna sheets, because that would have really created a nice look. Mollie Katzen has finally made her way into my kitchen. Frankly, I'm surprised I held her off so long, as she is a classic in the vegetarian kitchen world. I could not make a list of recipes to try without something baked. For that, I went with her Russian Coffee Cake recipe. 1. 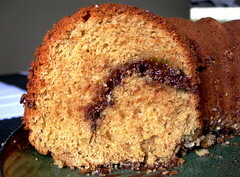 Preheat oven to 350 F. Generously grease a standard-size tube or bundt pan. 2. Place the butter and sugar in a large mixing bowl. Cream together with an electric mixer until light and fluffy. Add the eggs one at a time, beating well after each. Stir in the vanilla. 3. Sift together the flours, baking powder, soda, and salt into a separate medium-sized bowl. 4. Add the dry mixture and the buttermilk alternately to the butter mixture (dry/wet/dry/wet/dry). Mix just well enough to thoroughly blend after each addition. Don't beat or otherwise overmix. 5. Place the chocolate chips and almonds in a blender jar. Whirl together in short spurts until ground into a coarse powder. Combine this with the coconut in a small bowl. 6. Spoon half the batter into the prepared pan, gently spreading it until even. Spoon small amounts of jam here and there onto the batter. 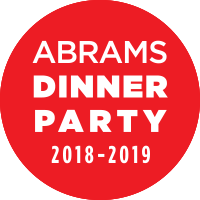 (Don't try to spread it - just leave it in little blobs.) Sprinkle on the apricots and about 2/3 of the chocolate-nut mix. 7. Add the remaining batter, distributing it nicely. Sprinkle with the rest of the chocolate mix, and bake the cake for 45-55 minutes - until a probing knife inserted all the way in comes out clean. Allow to cool completely before removing from the pan. Jenny's Notes: I chickened out a little on this recipe. I left the coconut out because Nathaniel doesn't care for it. I also left out the apricots at the last minute because I was afraid it would taste like fruitcake, but really regretted doing so. We still ate them for breakfast with the coffee cake, but the cake really needed them. I dumped half the chocolate almond filling mixture in the sink on accident, and am very sad about this. I think a better use of the last 1/3 of it would have been multiple layers inside the cake since sprinkling it on the top of what is baked becomes the bottom and smears all over the serving dish, and not much of it ends up on the eaters' plates! Overall this had fairly good texture and flavor and what it was lacking I believe was my fault for not following the recipe. You could taste the presence of the whole wheat pastry flour (usually my nemesis in baked goods) but it wasn't so much that it was overwhelming. Overall I wanted more filling - more apricot, more chocolate, and the coconut would have been very nice here. It started around Christmas time, when a friend sent me a gift card for King Arthur Flour, and told me I absolutely had to try the black cocoa. I had never heard of it, so I bought a pound to play around with. Since then I've heard this is what makes Oreos so black, but don't quote me on that one. I actually used it a couple of weeks ago in my Hi Hat Cupcakes because I was out of regular cocoa powder, but it wasn't as intentional as I wanted to be. I wanted to make at least one recipe that I had made before with regular cocoa powder, so I could compare them. Enter Alton Brown's Cocoa Brownie Recipe, one I find myself making more than any other brownie recipe, I think because it only calls for cocoa powder and not baking chocolate, which I can't seem to keep around the house. 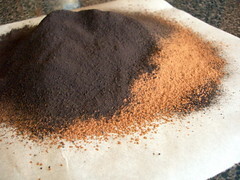 But with 1 1/4 cups cocoa powder, surely using black cocoa would make a significant difference! I followed Alton's recipe, merely substituting black cocoa for half the cocoa powder when it was sifted. Alton Brown's cocoa brownie recipe has been blogged multiple times, so please check the results at the Food Blog Search if you want to see the original. Preheat the oven to 300º. Butter and flour an 8-inch square pan. In a mixer fitted with a whisk attachment, beat the eggs at medium speed until fluffy and light yellow. Add both sugars. Add remaining ingredients, and mix to combine. Pour the batter into a greased and floured 8-inch square pan and bake for 45 minutes. Check for doneness with the tried-and-true toothpick method: a toothpick inserted into the center of the pan should come out clean. When it's done, remove to a rack to cool. Resist the temptation to cut into it until it's mostly cool. 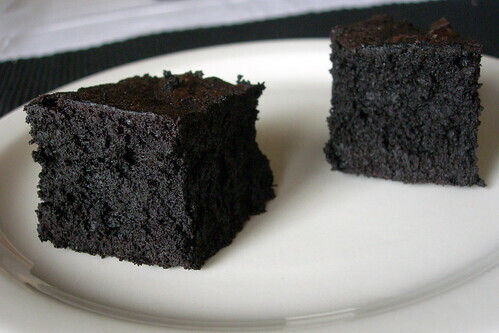 The result are dark chocolate brownies that are tender, chewy, and reminiscent of Oreo cookies. My students devoured them this afternoon. A pound of cocoa is quite a bit, so I still had a bunch to try. 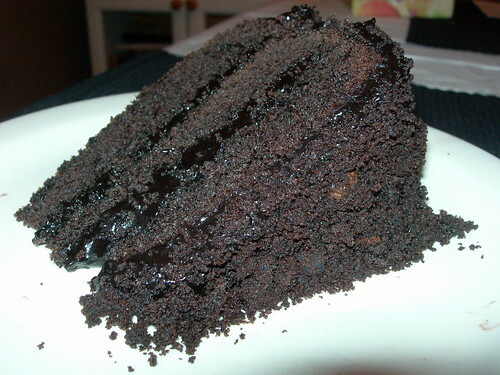 I remembered Gale Gand making a cake with Wayne Harley Brachman back when she had a show on the Food Network, and knew the Brooklyn Blackout Cake was a prime candidate for trying out more black cocoa. Throughout the recipe, any time cocoa was called for, I merely substituted half black cocoa for regular. 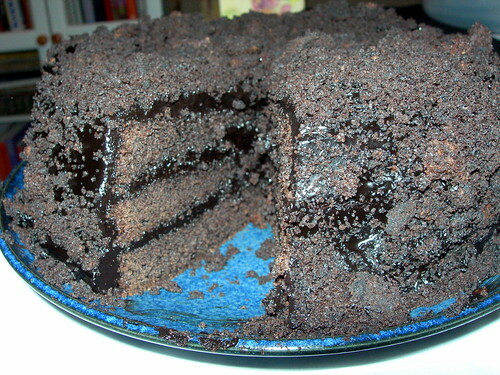 This recipe is usually called a blackout cake because you turn 1/4 of the baked cake layers into crumbs, and they go on the custard that is spread on the outside. It was almost unnecessary to do this with the blackness of both the cake and custard, but I still did it for the effect. I'm not sure this recipe was as successful as the brownies in taste and texture. To me, the extra crumbs on the outside give it the mouthfeel of being dry when it actually isn't. You haven't really lived, however, until you have stirred a bubbling pot of black chocolate custard on the stove - it just makes the entire baking experience surreal to make black colored things. The last thing I am dying to do is to make a dark hot chocolate. I'll keep you posted!